It is a short book, chock full of ideas and research surrounding the concept of Self-Determination Theory as defined by the work of Dr. Edward Deci. The three main principles of this theory revolve around the concepts of Autonomy, Relationships, and Competence. When our human needs are met in these three areas, we can build healthy moral development. The book stresses the need to build intrinsic motivation for our daily life and work, specifically, our work with students. It offers practical suggestions for working with our students to develop their sense of these three pillars and offers research in each individual area. I found this book to be filled with “yes!” and “uh-huh” moments. It aligns perfectly with my educational philosophy of helping students develop themselves rather than dictating every moment of their lives and learning. He quotes from the Character Education Partnership 11 Principles of Character Education, “When teachers promote moral and performances values such as academic integrity, intellectual curiosity, critical thinking, and diligence, students are better able to do their best work and gain greater autonomy, competence, and self-confidence.” (p. 20) This is it, in a nutshell, the entire book!! The concept that we can be our best selves (and our children can be their best selves) when our needs of autonomy, relationships, and competence are met seems like a no-brainer, but it takes intentional practice in the day-to-day of schooling to remember these elements. We must be intentional practitioners of character development. Striving to know our students, to understand the motivation behind their behaviors and choices-this helps build relationships. We must provide opportunities for our students to have true elements of choice in their learning-and may I selfishly add innovative choice-so that they develop a sense of ownership or autonomy. We must provide effective feedback that focuses on the strengths of our students and allows them to see areas for growth in a way that is constructive and developmental so they will build their internal sense of competence. This is a lot to ask of a teacher juggling 16+ children and many subject areas and differentiation. But, it is our task. It is our task to be responsible for the whole child and this means the moral development of children is paramount to academic learning. They are intertwined as a mass of roots and branches-character as the roots and academics as the branches. And with that, I say, Amen!! 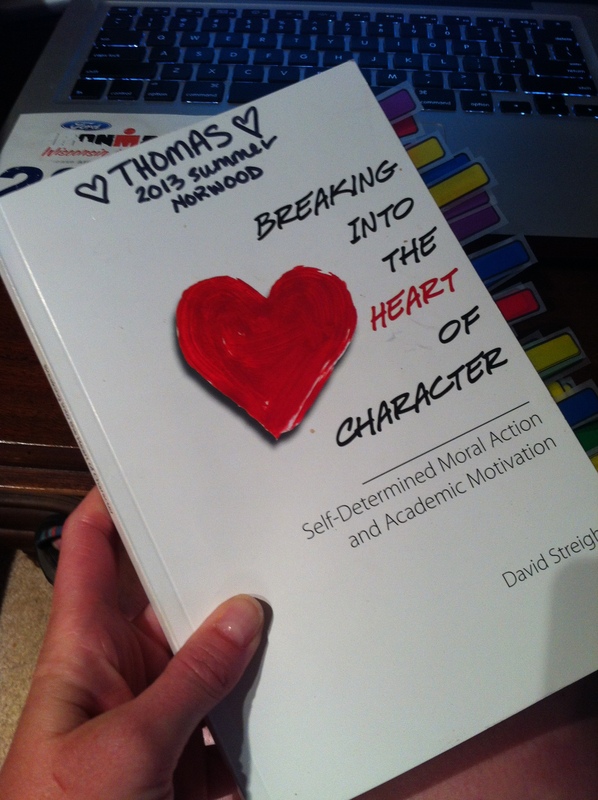 Further Resources based on Breaking into the Heart of Character.